MESA, Ariz. — The summer heat has returned and so have the Arizona Game and Fish Department’s annual public wildlife viewing tours. 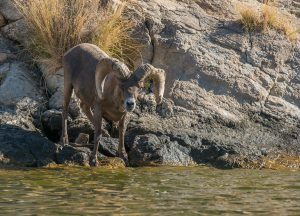 Here’s a great chance to view one of Arizona’s most iconic arid land animals – desert bighorn sheep – in an intimate setting June 30 and July 1 on Canyon Lake. Participants ages 10 and older will board AZGFD boats to explore the canyons and bluffs of this scenic lake in search of these spectacular animals. Biologists aboard each of the boats will share and interpret bighorn conservation, behavior and biology during the trip. Due to limited space on the boat, attendance is restricted to 30 people per tour. The location is home to some of the largest desert bighorn rams found in North America and Canyon Lake provides one of the best locations for congregating sheep this time of year. In addition to bighorns, bald eagles, herons and a variety of waterfowl are often seen. The area is also home to a myriad of other wildlife including deer, mountain lions, javelina and numerous small mammals, birds, and reptiles. The tour departs the Palo Verde Recreation Area at 7 a.m. and participants will need an $8 Tonto Pass for each vehicle parked at the lake. Tonto Passes are available at a variety of convenience markets and sporting goods stores around the Phoenix Metro area or from the Tonto National Forest Mesa Ranger District Office at 5140 E. Ingram Street in Mesa. Each boat will have an ice chest for the participants to use. It is recommended that participants bring a wide-brimmed hat, sunglasses, sunscreen and wear a long-sleeve shirt and long pants to prevent sunburn as the boats do not have canopies. The cost is $75 per person and participants can pay online via credit card or by check or money order. For more information or to register at https://www.register-ed.com/programs/arizona/186-world-of-wonder. Those with questions can contact Jeff Meyers at (623) 236-7589 or jmeyers@azgfd.gov. or Randy Babb at (480) 466-1334 or rbabb@azgfd.gov.